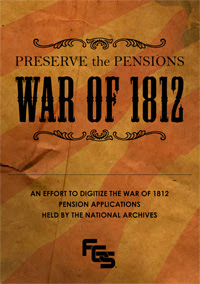 The goal of the “Preserve the Pensions” campaign is to raise the $3.7 Million needed to digitize the War of 1812 Pension Application Files that are currently stored in the National Archives and make them freely available online. There are over 180,000 Pension files that total over 7.2 million pages! The National Archives gets over three thousand requests per year to photocopy these records and this hard use is taking its toll on the original documents. By digitizing these documents we could halt further damage to these historical documents. The pages are being digitized as funds become available and some of these files are already viewable by visiting http://go.fold3.com/1812pensions/. Editors Note: The War of 1812 pensions can contain invaluable genealogical information and are a wonderful early 19th century set of records for a time period when not all records survive! June 25, 2012 – Austin, TX. The Federation of Genealogical Societies (FGS) announces the donation of a generous gift in the amount of $135,000 from the estate of the late Jon Stedman in memory of his mother, Ardath Stedman. The donation to the Preserve the Pensions – War of 1812 Pension Digitization Fund will be used to help preserve and digitize War of 1812 Pension records. Hollace Hervey, executrix of the estate, indicated that Jon Stedman was "always interested in preservation and bringing information to the front" so genealogists could more easily use it. Besides caring passionately for facilitating genealogists doing good research, Stedman had a deep love and affection for his mother who was a genealogist in her own right. The Preserve the Pensions project is just such a preservation and access endeavor, and FGS is honored in receiving this generous donation. The $135,000 donation is a significant lead gift to the Preserve the Pensions project as FGS ramps up its fundraising efforts during the bicentennial of the War of 1812 which started on June 18, 2012. Members of the genealogy and family history communities as well as the general public are invited to learn more about this important record preservation project by visiting the Preserve the Pensions website at www.fgs.org/1812 and assist with honoring our nation’s heritage by preserving the records of our past.